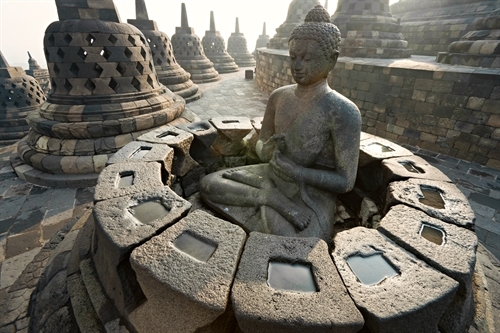 Buddhist heritage: The 9th-century Borobudur Temple in Central Java, Indonesia, is a UNESCO World Heritage site. It is the world’s largest Buddhist temple, as well as one of the greatest Buddhist monuments in the world. — Photo courtesy of Embassy of Indonesia. On the occasion of the National Day of Indonesia today, Việt Nam News presents an article written by H.E. Ibnu Hadi, Indonesian Ambassador to Việt Nam. On 17th of August this year, Indonesia will celebrate its 71st Independence Day, at a time when the world continues to face uncertainties and challenges. Under the second year of President Joko Widodo’s administration, however, Indonesia is continuing to spare no efforts to contribute positively for its people and the peoples in the region as well as around the globe. This year’s 71st celebration is accompanied by some notable achievements, particularly in the economic sector since the current government has underlined that economic transformation is its main focus. Among many achievements, the first would be the government’s ability to manage the Indonesian economy to grow at about 5 per cent within the first half of 2016. Amid the unpredictable global situation that all countries of the world are now facing, this result is something that deserves appreciation. Through a series of economic package reforms issued by the government, reaching 11 programmes so far, economic stability has been kept on a positive trajectory as an engine for development. Among these policies, the government has put its highest priority on improving the ease of doing business. By doing this, Indonesia has attracted the largest portion foreign investment in the ASEAN region, amounting 34 per cent in 2015. Infrastructure is also a key factor to further develop the country. Realising the importance of infrastructure in solving problems of logistics and distribution, the government is intensively building an extensive road network connecting several important major points within the large islands from Sumatra to Papua, with a target of 6,000km to be completed in the upcoming years. Moreover, as the world’s largest archipelago state, Indonesia is blessed in having one of the longest coast lines covering some 99,093sq.km; a vast sea area of more than five million square kilometres; with 13,466 named island among 17,500 islands in total. This imposes challenges as they divide Indonesia into many internal seas. Rather than seeing this as a problem, these waters are deemed important parts of the sea toll road transportation programme, especially considering how vital the seaports are to facilitate the smooth handling of goods. It is also a significant component of achieving just development throughout the country. The inner-island connectivity will be beneficial to forging Indonesia’s strategic position to become a maritime axis, while potentially further strengthening its already-possessed comparative advantages. Situated on the strategic intersection of the Indian Ocean and the Pacific Ocean, it allows Indonesia to offer accessible and efficient trade routes to many attractive markets. In the field of foreign policy, Indonesia has been well-known for its stance in playing an active role in promoting peace both regionally and internationally. The world is currently encountering growing threats, be they traditional or non-traditional. The on-going conflicts and instability, coupled with the increasing extremist security issues of radicalism and terrorism, have become a common situation in some parts of the world. Indonesia has been and will consistently be part of the solution by pursuing peace and prosperity through dialogue and other peaceful means using various fora. Hundreds of bilateral and international meetings and concluded agreements are witness to how Indonesian diplomacy is working. It includes, among others, the holding of the Asian-African Summit in 2015 in Jakarta and Bandung, and the Roundtable Meeting on Addressing the Root Causes of the Irregular Movement of Persons in 2015. The capital of Indonesia, Jakarta, has gained rising acknowledgment as a diplomatic capital of ASEAN, as illustrated by the high number of foreign missions to open in the city. This year, 2016, is the starting point of the ASEAN Economic Community, and as members of the regional grouping, Indonesia and Việt Nam are required to prepare themselves to maximize the opportunities brought by the community for their people. However, the introduction of the ASEAN Community should open up greater possibilities for both countries to strengthen their co-operation and joint efforts in as many fields as possible. In addition to being ASEAN members, Indonesia and Việt Nam are also strategic partners, which share various similarities, such as huge, young populations, emerging power and a growing middle-class. All of those elements are important impetus for having closer ties and a stronger relationship in the future. In terms of bilateral trade volume, both countries have enjoyed a stable path, though the economic downturn has slightly decreased the figures from US$5.38 billion in 2014 to $5.02 billion in 2015. We have to continue our hard work to achieve our bilateral trade target of $10 billion in 2018. The links and mutual understanding between our people are the important things that need to be nurtured and improved. In doing so, by working closely with the media and offering scholarships for Vietnamese students to stay in Indonesia, we can focus our energies to promote a closer relationship among our peoples.